How to Plan a Great Conference: Hosting a conference is a great way to bring your customers together and establish your organization as a leader in your industry. Connecting your clients with industry influencers ensures your name is synonymous with success, which means that a well-run conference is a must. Understanding your event type is important– many first-time conference planners lose sight of that. For each type of event, there is an ideal format, so curate your material accordingly. Not sure whether you’ve got the right agenda format for your event? Do your research well ahead of time. Details are essential to the success of your conference. Add the right details and your audience will love you. Miss the details and you’ll miss out on a great opportunity to wow your client base. Giveaways are a great example. If you’re hosting a Scrum conference, branded scrum gear will make people very happy. Hosting a business event? Give away free day planners. Offer your audience useful tools to show them feel involved – this positions you well in their minds. As far as the logistics details, make sure you’ve got everything well-coordinated. From hotel and food to registration, internet, audiovisual, and of course the flow of the event. Tending to these details will ensure a smooth experience for your guests. It’s not only invaluable to your brand image, it will keep your attendees coming back year after year. With details comes the need for adequate staff– no matter what your budget, never skimp on people. Running a successful conference is an all-hands-on-deck scenario, and it takes a lot of hands. From curating the program and dealing with speakers to budget and sponsorships, design and content– the list goes on. You’ll need to ensure that you have enough staff on hand to deal with everything efficiently enough to provide a quality experience for attendees. Volunteers are a great thing, and many organizations use them to help host conferences. But a word of caution– make sure you’re getting quality effort. Never assume that just because the work is free, it’s enough. Lead your volunteer team with the same level of intensity as you lead your paid team. Set expectations, check-ins and keep things organized. The success of your conference is riding on the quality of both your paid and volunteer team members. Depending on what type of event you’re hosting, your program design should adhere to the best format for delivering value to your guests. Source your speakers based on what you’d like to see presented. 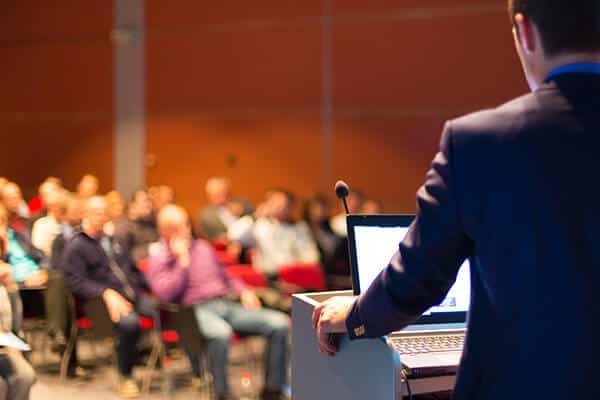 Be sure to get a rundown on your speakers’ presentations, and make it clear you don’t want any surprises. Dealing with speakers can be tricky, from sourcing great speakers to negotiating price and making sure they’re on the stage at the right time delivering the right material. In other words, plan carefully. The difference between a well-planned conference and poor planning can affect your firm’s position in the industry. A poorly planned conference is so obvious to all involved. At Pure AV, we provide the best conference AV production solutions for events of all sizes. Our team has provided stunning presentations for organizations at venues all across North America. We’ve built a solid reputation for both collaborative work and technical insight. We only use conference AV equipment of the highest caliber and hire only the most competent and helpful staff. At Pure AV, we believe that conferences are the ultimate tool for connecting people and developing influence. We’ll help to ensure impeccable execution so you can focus on what matters most– providing the best value for your guests. Next step: get in touch today and we will get you a quote within 24hrs.